Everyone remembers 2014 as the year The Land Conservancy of San Luis Obispo County protected the Pismo Preserve. But in all the hustle and bustle surrounding this large and very public project, a local organic farm nestled in the Los Osos Valley was conserved as well. For The Land Conservancy, whether 10,000 acres or 200…each project the organization adopts has incredible value. The organization chooses these conservation projects based on numerous factors including threats analysis, local planning data, and wildlife corridor linkages to name a few. Los Osos Valley extends from the city of San Luis Obispo, west to the small community of Los Osos. Over the past decade, numerous developments surrounding the city have converted local farms and ranches into shopping centers and residential communities. These in many ways are the natural growing pains that occur as population increases. Although land conversion is not new, it is something that can be strategically addressed in certain areas, such as Los Osos Valley, where prime farmland soils and steelhead streams grace the valley bottom. In 2012, the 530-acre Highland Ranch was conserved using conservation easements. In 2014, The Land Conservancy worked with Vintage Organics owner Lisen Bonnier to extend that conservation of Los Osos Valley to include her nearby farm where she produces organic flowers, vegetables, and seed. Although her farm is modestly sized at 226 acres, the resource values protected are magnificent, with prime farmland, coast live oak woodlands, and serpentine rock being just a few. The project was made possible through the Department of Defense’s Army Compatible Use Buffer (ACUB) program. Locally, this program is implemented through the partnership between The Land Conservancy and Camp San Luis Obispo. The program strives to protect the installation’s services and training needs through voluntary conservation easements, which limit development near the base. The program is a win-win for the military and local land conservation. 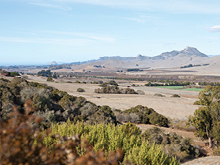 To date, both of the Department of Defense’s land conservation programs, the Readiness and Environmental Protection Integration (REPI) and ACUB, have conserved over 1,100 acres surrounding San Luis Obispo, with additional funding possible for future projects.